Breeder-Judge on trimming or grinding toe nails to prevent foot damage which judges see as neglect. Learn how to completely groom your dog. Every pet owner dreads the chore of cutting toe nails. Preparing your puppy for this grooming “intrusion” into his personal space will make the experience less traumatic. Buyers welcome a pet into their home at approximately eight weeks. A reputable breeder starts trimming toenails from the “get-go”. This gives the new owner a “jump start”. This is done so the puppies will not scratch the mother when nursing. Teeth and toenails are one reason females wean puppies early. Puppies become accustomed to being held for nail trimming. They understand what to expect at an early age. After purchase, it is up to the new owner to trim the nails periodically. Toe nails grow at a rapid pace. Here is an example of what happens and how long toe nails can permanently damage joints from the toe to pastern (wrist) up to elbow, shoulder, and hip joints. In the wild, coyotes and foxes wear their nails down digging and running across hard ground, so this problem doesn’t exist. Pets rarely leave a carpeted area or couch today. They may be allowed to run in a yard, but usually time is limited. Feeding a raw diet and giving raw bones will increase the rapidity of nail growth. Do NOT cut toe nails on a grooming table if the dog is intended to be a show prospect. Most dogs consider table grooming an acceptable and enjoyable procedure. On the other hand, trimming toe nails on the table has the adverse effect! Smaller dogs are more difficult than larger dogs and can jump out of your hands and injure themselves! Using the table to trim nails can cause quite a commotion. From that day forward, the dog will view being “tabled” as a traumatic experience and will hear you pick up the clippers from a room away. 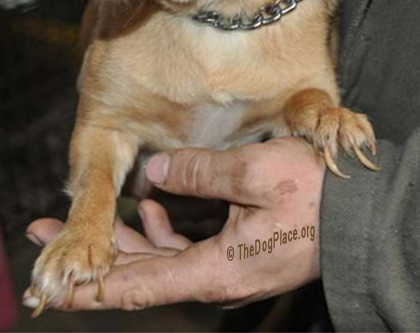 Hold a small dog under one arm to trim nails. If the dog objects, whirl about one time and disorient the dog. Trim quickly. One might try placing a larger dog on its side on a towel on the floor. If the dog objects, place your body gently over the dog and say “Stay” firmly. This places YOU in the “alpha” position. Your dog, realizing the inevitable, will hopefully submit. Have someone talk to your dog as a distraction, but NOT in a sympathetic tone of voice. Remain calm! 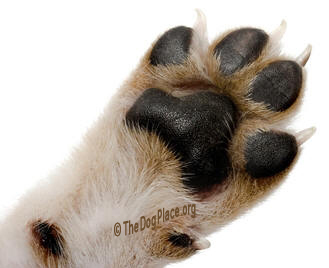 Grip the “ruff” on a long coated dog and hold the foot in the same hand. This connects the head to the foot and it is harder for the dog to pull away. One might trim hind feet from the back of the foot. Some dogs are tolerant, others choose to fight. With determined or aggressive dogs, contact a groomer or veterinarian and let them do the “dirty deed”. They have less sympathy and are more efficient. It’s a nasty job but someone has to do it for the dog’s health and safety. If you take the dog to the vet or groomer, DO NOT stay and watch the procedure. Like children, they sense your presence and it makes nail trimming more difficult. The downside of NOT trimming nails is a crippled dog. Picture never cutting your own toe nails. Front feet will break down in the pasterns, the toes will splay out and the feet will become flat. Long rear toenails will cause the feet to turn out and as in the pasterns, can cause arthritic changes. Weight adds to this condition and spreads the rear feet. Some dogs may attempt to chew toe nails down (or they will start licking their feet) if they become too uncomfortable. If this point is reached, there is a serious problem. The larger the breed, the tougher the toe nail. The tougher the nail, the larger the tool. For small dogs, “cat nail clippers” are good and quick. Human toe nail clippers splinter the nail. Some people prefer to use a grinding tool. Small hands cannot control a large apparatus and a squirming dog at the same time. Purchase a small grinder, a “Dremel” tool for easier handling. One might file the nails, but patience is required. DO NOT force the issue when doing an older dog as it may cause injury. Leave this chore to a professional. White toe nails are the easiest to cut. The vein is visible. Cut up to the vein in the toe nail. Darker toe nails are more difficult because you can’t see the quick. Cut just to the curve of the nail. IF you “quick” the dog, there is blood stopper (styptic) powder and pencils to stop the bleeding. NO, your dog will not die if the nail is cut to the quick. Often some dogs will bleed for a longer length of time. This is normal. Excessive bleeding could indicate Von Willibrands Disease but most breeders test for VWD and eliminate such dogs from their breeding programs. The more one trims nails, the more the quick recedes. Persistence will get those feet back into shape quickly. Some breeders deliberately cut the nail beyond the quick, and then pack it to present a tight foot. This is painful to even think about and opens the door to possible infections. Usually breeders remove puppy dew claws at birth. There are several methods. Hemostats may be used for a bloodless removal at 2 days. Surgery such as cutting into the bone and stitching for complete removal is done by veterinarians. Scabs will form over these wounds. They must be monitored closely to insure infection doesn’t set in. Soak the scab and keep the area clean... Remove the hardened scabs once they soften and gently clean with a soft cloth. This will be required more than one time. Serious infections can require foot removal. Other methods are used, depending upon preference. 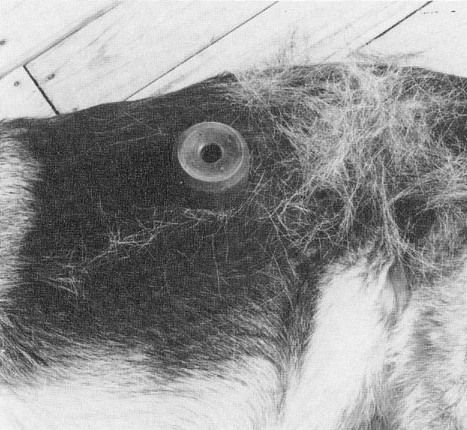 Some Veterinarians remove dew claws on older dogs. This is terribly painful to your dog. (Picture cutting off your own thumb or toe) A valid reason should be given if your dog is to suffer this procedure. Granted, dew claws may be a determent regarding hunting dogs due to rough terrain, briars, and brush. Removing them could eliminate injury. AKC Breed standards address removal or acceptance of existing dew claws. The Great Pyrenees, Briard, Beauceron, and Norwegian Lundehund are breeds requiring dew claws to assist in their function. Other standards prefer that dew claws be removed. Each breed must satisfy their individual standard requirement. It’s best to cut nails after a bath as they are softer. Another time is when the dog is tired and ready to nap. “Once you start cutting toe nails, NEVER TAKE NO FOR AN ANSWER. The dog must NOT win. If you have a young puppy, when you hold and cuddle it at other times, massage the paws gently so it becomes accustomed to your touch. Go through the process of trimming or grinding nails even if it’s impossible to address all four feet. Do not turn your dog loose! If the dog gets its way, this behavior will intensify with each attempt. Do a few nails on each foot if necessary. Take more than one session to complete. Give a treat now and then. Like bathing and blow drying, most dogs improve in time. Always remember, your dog’s feet are equally as important as your own. 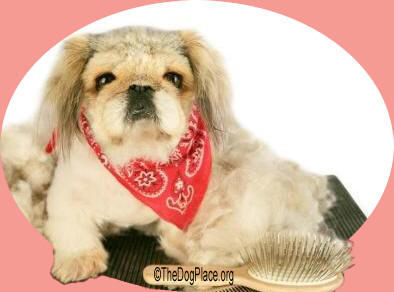 Save time and $$$ by grooming your own dog; PHOTOS show how. 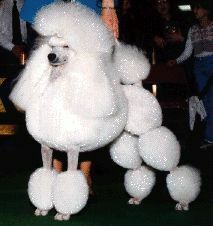 Start grooming your poodle puppy's unique hair-coat at home. 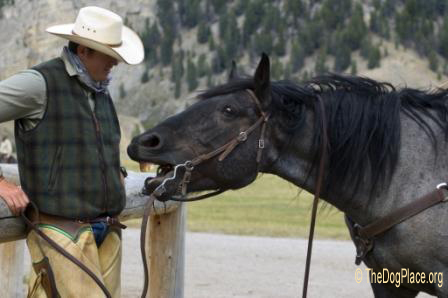 AQHA & AKC rules regarding cosmetic alterations and ring infractions.